This is the page for the AUTOFOCUS-O7 Project, intended for seasoned filmmakers to stretch their talents using cheap equipment and editing tools. Tired of troublesome shoots with cumbersome equipment? Want to take a break? ...or maybe you're open to a challenge, and want to see the kind of wooden sculpture you can whittle with a nail file. Whatever it may be, AUTOFOCUS-O7 is mainly for filmmakers willing to see what they can do, using nothing more than what their film-illiterate next-door neighbor might have at his disposal. 1. Whatever sound you cannot get with the camera itself, cannot be used. This includes music. 2. Only the camera's on-board mic is allowed, and only auto settings for the picture and sound. 3. Only two editing programs are allowed: Windows Movie Maker, or iMovie, as they are already included on the average computer. In addition, only one of those two may be used on a project. 4. Post-production on the picture and sound is limited to the tools present on your editing software. You may, however, export as many stills as you want; the only program you're allowed to modify them with, however, is whatever paint program came with your computer (i.e., MS Paint for Windows computers). 5. Any other video masters (i.e., DVDs) may be rendered with whatever tools are at your disposal, but only from a master tape (i.e., MiniDV) recorded directly from the original editing source. Neither the audio or the visual editing may be modified from this tape, though A-B rolling is permitted* in addition to blank header and footer to be removed later. 6. No unlicensed music is allowed; if you use music, it is either your own, or you have explicit permission to use it. However, it is encouraged to find ways to masterfully craft a scene without musical background. 7. Only one camera can be used for the film. 8. Remember to keep the tools consumer-level; whatever tools you don't see your average Joe consumer using, don't use. 10. There is no "E" for "Exception". Find ways to creatively work with the rules, and remember to have fun! *A-B rolling: originated in film negative cutting. Basically, you're rolling two master tapes, and each one would only carry every other shot (so tape A would have shot 1, blank video, shot 3, blank video, and tape B would have blank video, shot 2, blank video, shot 4...). On film, it was to accomodate color timing and dissolves better; here, I encourage a 2-frame extension on both ends of every shot for conversion programs. If you've made a movie complying with these rules, e-mail me at EJones216 [at] yahoo.com with subject line "AUTOFOCUS-O7" for inclusion on the website. 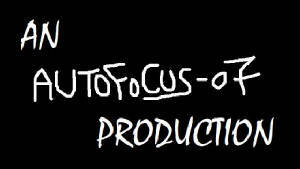 On YouTube and Vimeo, tag it with "AUTOFOCUS-O7" [the letter "O", not the number "0"]. I look forward to seeing what all of you can do.